Morgan James Publishing, 9781683505730, 256pp. 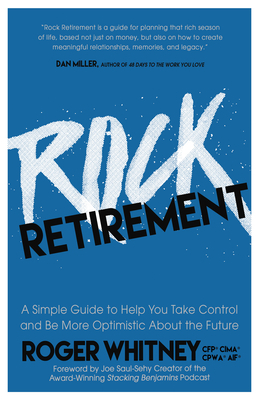 Rock Retirement offers inspirational advice on how to enjoy the journey to retirement to its fullest. Traditional retirement advice usually boils down to saving more, sacrificing more, and settling for less. This approach makes people dependent on systems outside their control, such as the market, economy, and investment returns. The result: people lose power over determining their life. What sets Rock Retirement apart is its holistic approach to helping people take back control and act intentionally towards the life they want. It addresses the fears, hopes, and dreams that people have about retirement, goes way beyond the numbers, and shows them how to balance living well today and tomorrow. Roger Whitney is a practicing financial planner with over 25 years experience walking life with clients. He developed an Agile Retirement Management System focused on helping people make the most of the only life they have. He is past instructor of the Retirement Planning & Employee Benefits CFP(R) certificate program at University of Texas Arlington and of Wealth Management at Texas Christian University.